The last remaining BT Sport viewers who receive the channels alongside Freeview on channels 58 and 59 are being offered a free Chromecast worth £30 to continue watching BT Sport in 2015. BT has been contacting affected customers via email and letter with the offer, confirming that BT Sport 2 will cease to be available on the digital terrestrial television platform from the 5th January 2015. BT Sport 1 will continue to be available "until the middle of next year", according to the letter, which is signed by Libby Barr, Managing Director - BT Customer Care. BT letter to customers, dated November 2014. 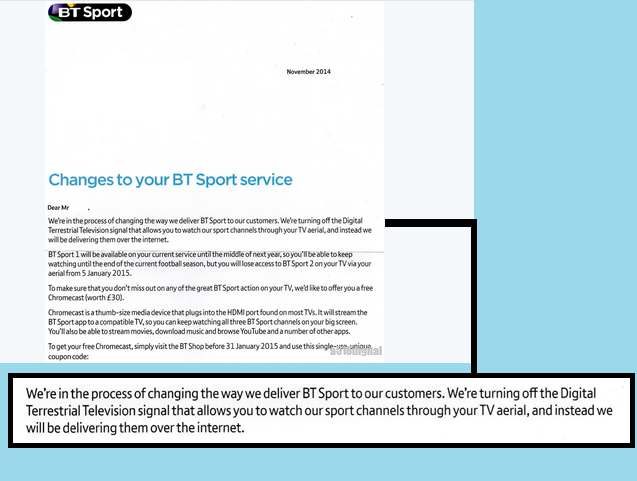 The letter, a copy of which was supplied to a516digital and shown above, advises affected customers that the free Chromecast (a media device/stick from Google), will enable them to stream BT Sport to their TV via the BT Sport App. Importantly, the Chromecast delivered service will enable users with slower broadband speeds to continue accessing BT Sport. Those who have received emails or letters about the offer have until the end of January 2015 to claim their free Chromecast. BT Sport has been delivered over terrestrial TV since its launch in August 2013 for the benefit of BT customers who didn't live in an area served by BT's fibre-based Infinity superfast broadband. Back in October, BT migrated viewers with standard broadband from terrestrial to broadband reception of BT Sport, providing they had a minimum speed of 5Mbps. BT insisted in October amidst speculation that the terrestrial TV service was coming to an end that customers in non-fibre areas with sub 5Mbps speed would continue to be able to watch BT Sport via an aerial. Despite this, just over month later, BT began informing customers of the move away from terrestrial TV. The terrestrial TV service was always intended to be a stop-gap until broadband delivery using multicast technology could take its place, and there had been speculation ever since BT stopped new subscribers signing up for the terrestrial TV version earlier in 2014 that the move might be sooner rather than later. Since 2012, BT has offered TV via two different platforms: its original BT Vision service and BT YouView. BT Sport on channels 58 and 59 were exclusively available to BT Vision box owners, as were Sky Sports 1, 2 and lately Sky Sport 5. A Competition Appeals Tribunal ruling in Ofcom and BT's favour last month has now paved the way for BT to shortly begin to offer Sky Sports 1, 2 and 5 on its newer YouView-based service. This means there's now scope for BT to completely close down the older BT Vision service. Earlier this year, BT switched off its oldest Vision boxes, encouraging users to switch to YouView. A similar move with the last remaining BT Vision appears very likely. See more about the Chromecast available to affected BT customers on the BT website. I'd rather a pay channel than another shopping channel. Like it or not Motors TV and Film4+1 are ahead of the game migrating from the traditional standard - and with OFCOM more concern about folks watching TV on mobiles than on TV others are going to have to follow suit soon.